With blessings from their mothers and wives on Mother’s Day, members of the CCAP Pro-am and Junior teams traveled to Bear Mountain, NY to compete in one of the Northeast’s most demanding road races, the Lucarelli & Castaldi CRCA Bear Mountain Spring Classic. The 100 mile road race takes place over seven laps that each include a 2.5 mile climb and several long rollers. The Elite Men’s Pro/1/2 race began in controlled fashion. CCAP Pro-am riders Dave Hoyle, Hunter Resek, and Connor Walsh covered dangerous attacks while Tim Ahearn and John Harris rested in the main field. Late into the third lap, Ahearn joined a breakaway group of 15 riders. The break looked promising, but was brought back two laps later. Harris then launched a well-timed counter attack upon the retrieval of Ahearn’s group that kept the pressure on other teams to chase. Harris’s attack was finally neutralized one lap later. With less than two laps to go, Hoyle forced the race’s final selection by attacking the remainder of the lead group. The attack drew out the race’s seven main contenders and this group began the last lap destined to stay away to the finish. The final bids for victory were launched with 5km to go, shattering the eight man breakaway into three groups. Hoyle fought his way into the second group to finish a hard fought 6th place. 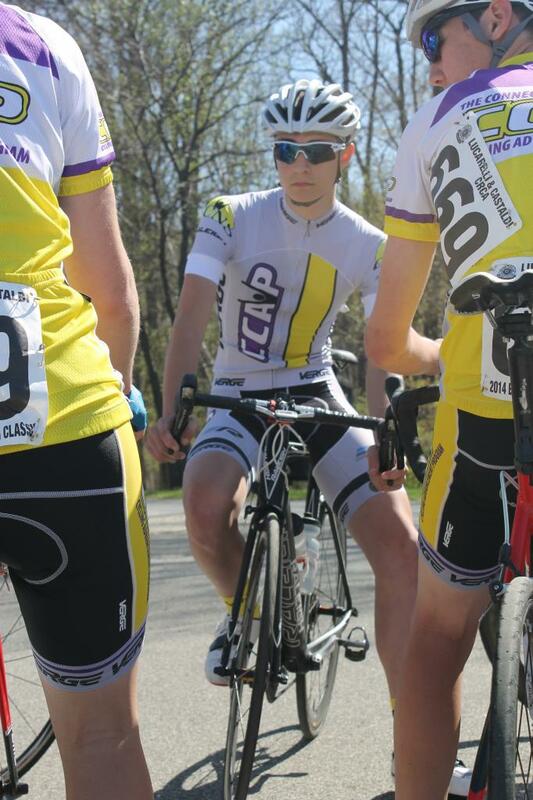 Meanwhile, CCAP Junior Derek Cote finished 6th in the Men’s 2/3 race while teammate Tom Evelein took 3rd in the Juniors!